Shop for a massage stool to save your body and make your work more efficient. 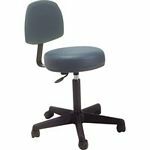 We offer portable stools to take on out calls, hydraulic massage stools which can be adjusted easily to the proper working height for your body and stools with backrests for extra support and comfort. You may also want to consider a table cart if you plan on transporting your massage table. 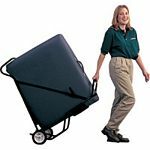 Massage Table Carts fold for easy storage and make moving from place to place with your massage table a breeze! Pisces Rolling Stool - Free Shipping!